Part 2 of Do Data Management Tools Improve Perceived Sustainability Performance? In our last post, we set the stage describing a new study conducted by CSRHub and Tennaxia investigating the correlation between a company’s sustainability performance and its use of specialized data management software. To continue, the results from our study are outlined below. Tennaxia supplied CSRHub with the names of fourteen of its customers. We can assume then that the companies we were given are ones who have used Tennaxia software for a while and who are satisfied with its performance. We found that CSRHub had data on thirteen and enough data to rate ten of these fourteen companies. CSRHub has at least some data on 140,000 companies and other entities, but has only so far been able to rate about 10,000 of these. As we can rate only about 7% of our universe, the 10/14 coverage for Tennaxia’s customer set is a higher than average proportion. About 70% of CSRHub’s ratings are complete. For these companies we can rate social performance in all four major sustainability areas: Community, Employees, Environment, and Governance. We had full ratings on eight of the ten Tennaxia companies we rated—80%. 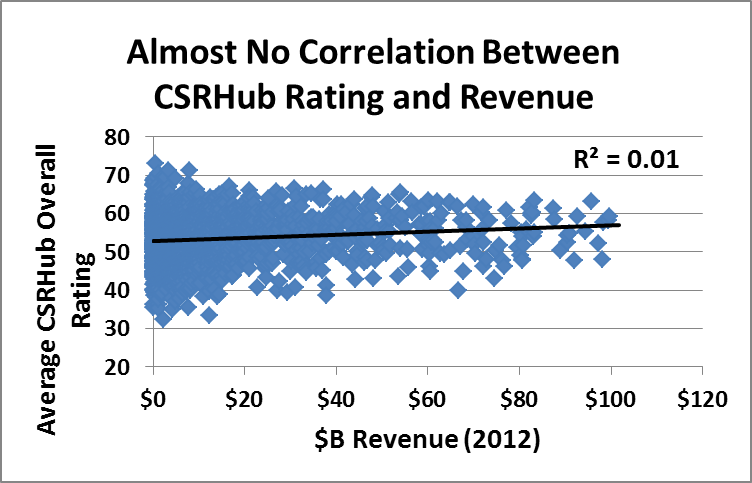 As we expected, the average percentile rank of the six Tennaxia companies that CSRHub fully rates was well above average. The percentile rank compared to all CSRHub rated companies ranged from 74% to 99%--with an average of 88%. These high relative scores were not due just to a focus on certain high-sustainability industries. The average rank for Tennaxia’s customers versus other companies in their industry was 85th percentile. While the eight companies involved are larger-than average, we have found that company size by itself has little effect on CSRHub’s ratings. CSRHub tracks sustainability performance in twelve different areas. The average ratings across these areas were strong for the ten Tennaxia clients for whom we had multiple rated areas. Note that all three employee subcategories had above average scores—one of the areas we expected to see strength. The Tennaxia-using companies also did well in our three Environment subcategories—an area where software tools should be helpful. The two weakest areas were places where EHS and CSR Data tools would not be expected to play a role. Community development and philanthropy are functions that may be managed by groups outside of the corporate social responsibility (CSR) function in many companies. Board quality and procedures are also outside the scope of most sustainability software tools. This study used a small group of companies. We had the support of only one software vendor. We did not conduct supporting interviews or study outliers to look for specific examples of best or worst practice. However, the general tone of our results is consistent with our hypotheses and is consistent with the feedback we’ve received from working with the more than 14,000 corporate sustainability professionals who use CSRHub. We believe that commercial software tools will become an increasingly important part of managing CSR and sustainability programs and that they can help companies improve their social and business performance. We thank Tennaxia and Rescore for their support of this study and hope that other software firms will step forward to do similar work to help substantiate the value they claim for their products. CSRHub provides access to corporate social responsibility and sustainability ratings and information on 13,700+ companies from 135 industries in 104 countries. By aggregating and normalizing the information from 360 data sources, CSRHub has created a broad, consistent rating system and a searchable database that links millions of rating elements back to their source. Managers, researchers and activists use CSRHub to benchmark company performance, learn how stakeholders evaluate company CSR practices and seek ways to change the world.